Buttery baby potatoes are tossed with fresh herbs, veggies, and an easy vinaigrette in this lightened up potato salad. 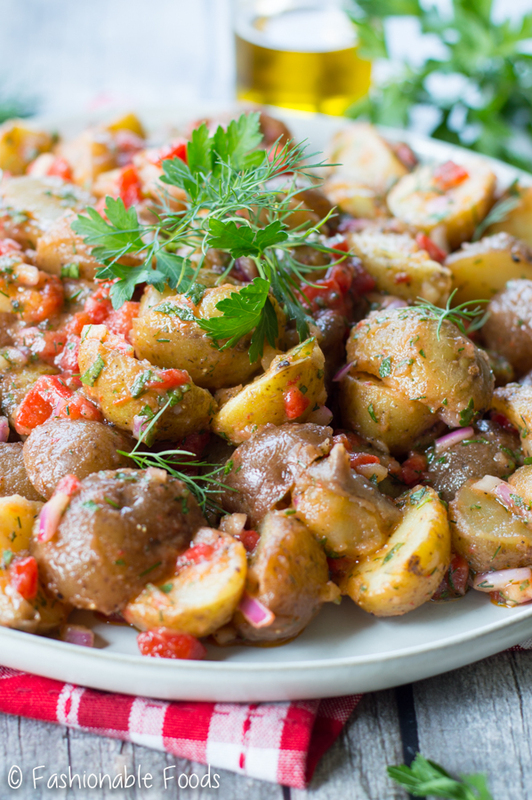 Vinaigrette potato salad will be the perfect addition to all of your summer picnics! **This recipe was originally published in 2014. The photos have been updated and the recipe tweaked, but the text remains the same. 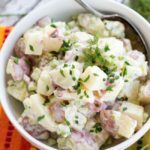 Potato salad is a summer staple at every picnic, and for good reason – it’s delicious and goes with just about anything. 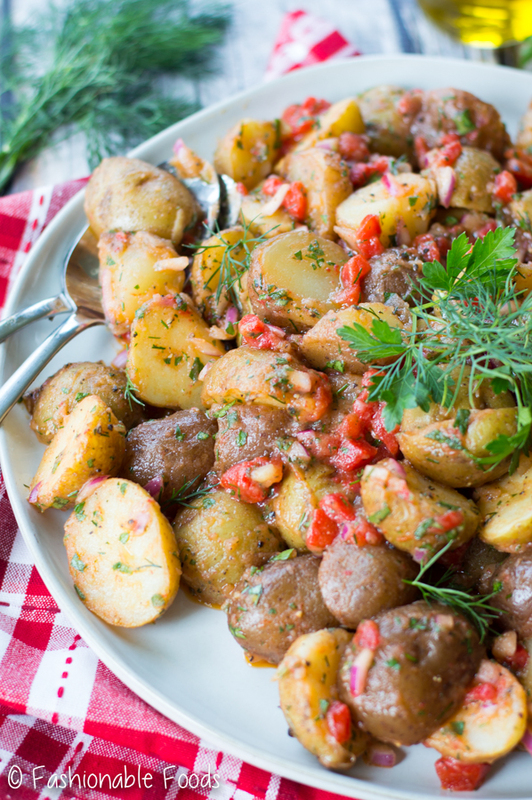 Typically potato salad is made with mayonnaise, which can be a little heavy. Now, don’t get me wrong, I love me some classic potato salad! This post was actually going to be my recipe for it, but I opened the fridge and saw I was out of mayo. Instead of moving on to something else or ordering takeout, I improvised! Instead of a mayo-based dressing I made a simple vinaigrette and added fresh herbs, pungent red onion, and sweet roasted red peppers. I ended up with one tasty potato salad! Last week we had a mini heat wave, which meant I wanted to get in and out of the kitchen fast. I had planned on grilled chicken and potato salad for dinner because I could make the salad ahead, and then quickly grill the chicken when it was time to eat. It was a really nice and refreshing meal in the sticky heat! 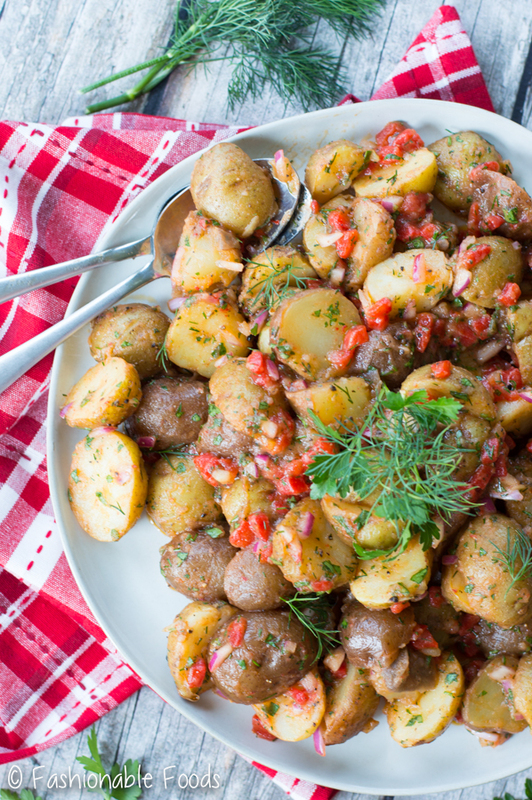 This lighter potato salad is perfect to serve at all of your summer picnics because it’s great cold or at room temperature, you can make it in advance, and it goes with everything! 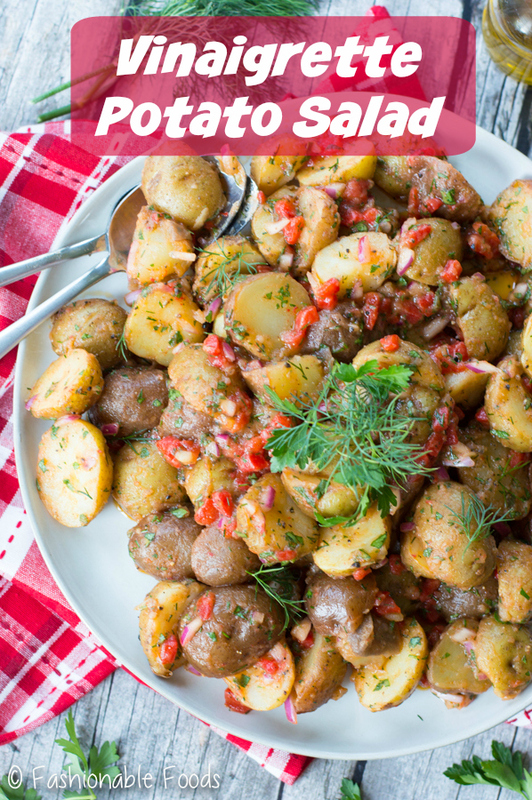 I love using baby potatoes – they are buttery in flavor and aren’t super starchy so they are perfect for potato salads. I leave the skins on for because they are thin, it adds a nice texture in the salad, and I really hate peeling potatoes! Plus, who the heck has the patience to peel little baby potatoes? Always start your potatoes in cold water; they will cook more evenly that way. You only have to cook these for 12-14 minutes – until they are just cooked through and you can pierce them easily with a fork. Drain them and let them cool while you get the rest of the ingredients together. I like to add slightly warm potatoes to the dressing because it helps them to soak up the flavors. You don’t want to add hot potatoes or all of the dressing will get soaked up, and we don’t want that! 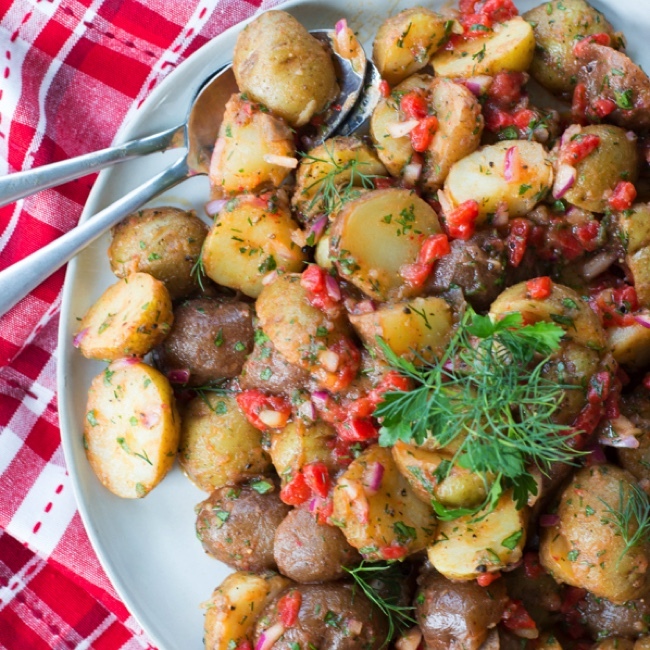 You can serve the potato salad right away, or refrigerate it for a few hours to overnight. I love it at room temperature, but it’s also really good cold too. Like I said earlier, this salad goes with everything. I served it alongside chicken that I seasoned with a chipotle rub and grilled – it was awesome! You could serve it alongside any grilled meat, fish, seafood, burgers, hotdogs – it’s really that versatile! 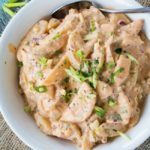 Next time you need an easy side dish on a hot summer day, give this one a try – you’ll be in and out of the kitchen in 20 minutes. You won’t even break a sweat! 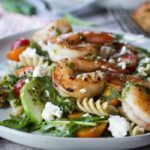 I have a feeling this salad is going to appear frequently on my dinner plate this summer…and yours too! Place the cut potatoes in a large pot of cold water; add a pinch of salt, cover, and bring to a boil. Cook the potatoes for about 12-14 minutes or until they are just tender and pierce easily with a knife. Drain and let them cool – you want them to be warm, not hot when you mix your salad. In a large bowl whisk together the lemon zest and juice, vinegar, dijon mustard, salt, and the pepper. Add in the remaining ingredients and the warm potatoes; toss gently to coat with the dressing. Serve at room temperature or chilled. 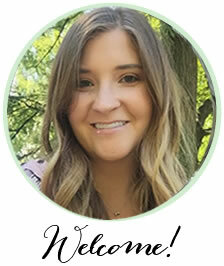 *If doing Whole30, be sure your dijon mustard is compliant! OMG! This looks really delicious. Would love to try this. In fact, we’re doing this tomorrow. Can’t wait. i cooked your salad and it was amazing. thanks a lot for the recipe.